So-called for the dazzling confusion of stripes as they huddle together making it impossible for the predator to discern each individual prey. 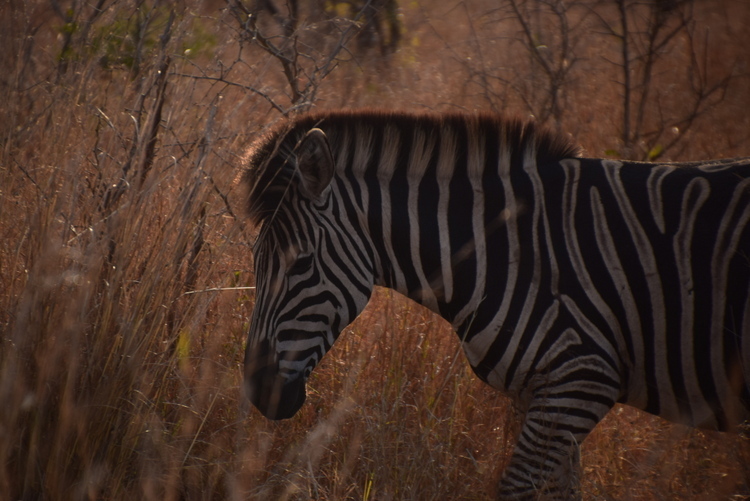 Here in the Kruger Park, we have time for trivia… and nothing like a few collective nouns to get one going. 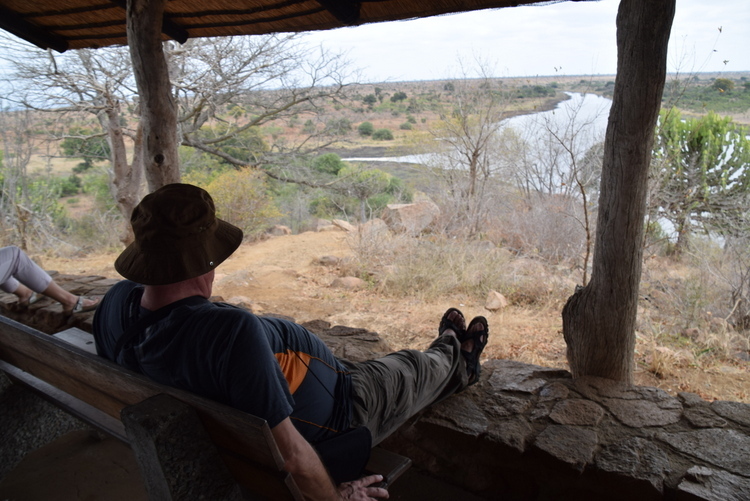 A crash of rhinoceros, a journey of giraffes – and as I sit here surveying the Crocodile River, I have to wonder what a herd of hippos is actually called? A huddle, perhaps, or maybe a heap? Our day in the park started early – really early – as we rose at 4.30am for a quick coffee and rusk while filling the many thermos flasks for our actual morning coffee break on the road. 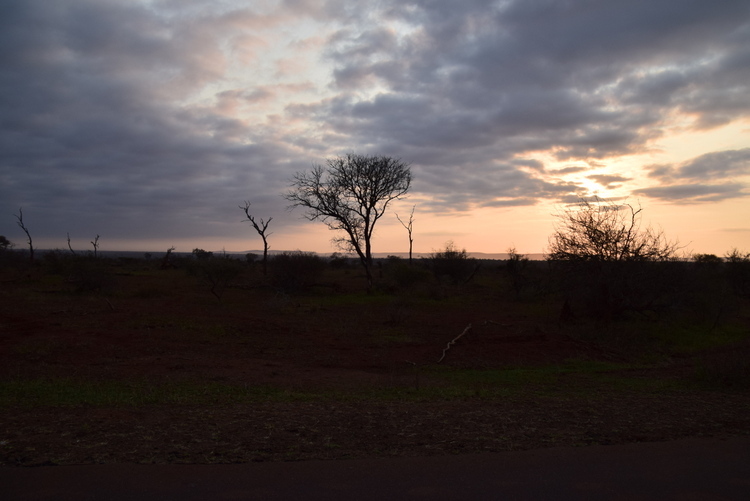 6am at Crocodile Bridge gate was worryingly crowded as we waited in the long queue for park permits, but once we were inside the gate, the vastness of the reserve swallowed up the seemingly excessive number of vehicles. This is a place where you choose to join the crowd of onlookers only when the view is spectacular, as in this sighting of a pride of 8 lions relaxing as if they’d been arranged for our viewing pleasure! Not all park visitors travel by car, though. Our ranger called this species “primate on bicycle” – one of the many people who I know not to try to change (the ranger, not the cyclist), though we did ponder on the age of the bicycle, and even more on the age of the rifle (or shotgun?) slung across his shoulder, as he cycled amidst the wildlife, and whether it would serve any useful purpose other than possibly clubbing off an attacker? In the manner of all good Hall / Jamieson / Sussman bush holidays, a full kit of breakfast goods was packed into the vehicle, for the mid morning brunch. 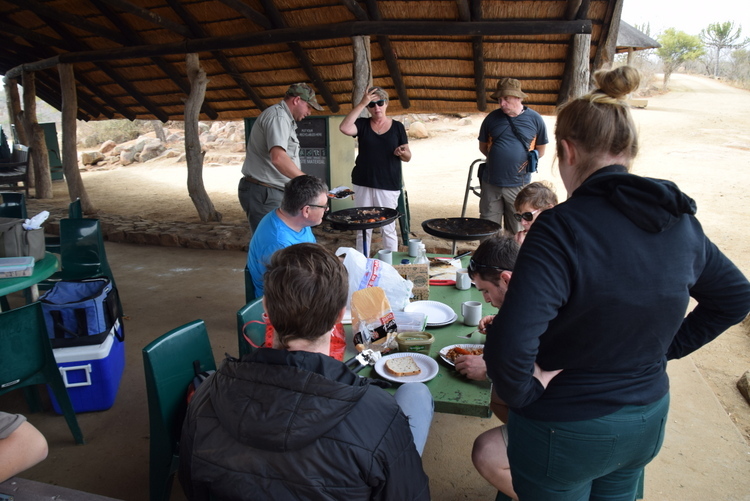 The ‘skottelbraai’ is still alive and well in the KNP… hire your gas bottle and wok-like metal dish (in our case two), and you will soon be feasting on bacon, eggs, tomatoes, mushrooms and beans… yum! Thank you Robert & Jamesy for the good feed. Family gathered for brunch… and Peter took a moment to put his feet up. While away down the river we watched a hippo arriving rather late back at the water… must have been grazing a long way from home during the night. 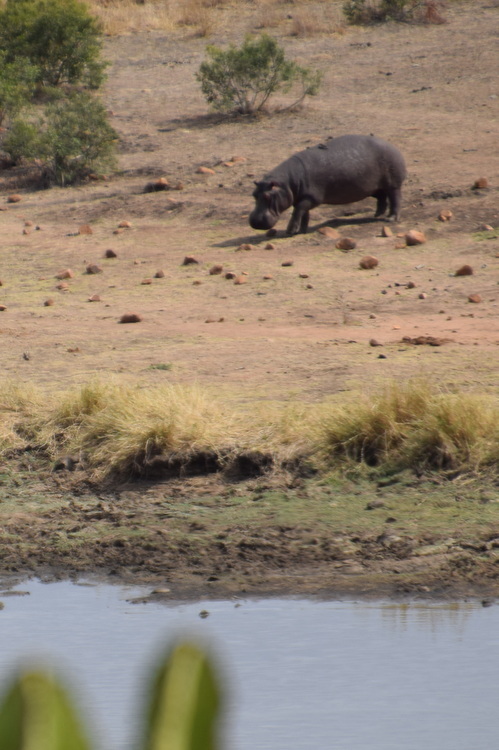 Mind you, the hippos have been incredibly plentiful – not a day goes by without seeing them, usually en masse. And often out of the water. The bush is, as always, full of both large and small sights. And you learn something new every day. This a crocodile track along the road – must have been huge is you look at how far apart his feet are (compared to the ranger’s boot). And who knew – well, probably all of you, but certainly not me – that guinea fowls roost in the trees at night! Amazing Africa – always fascinating.